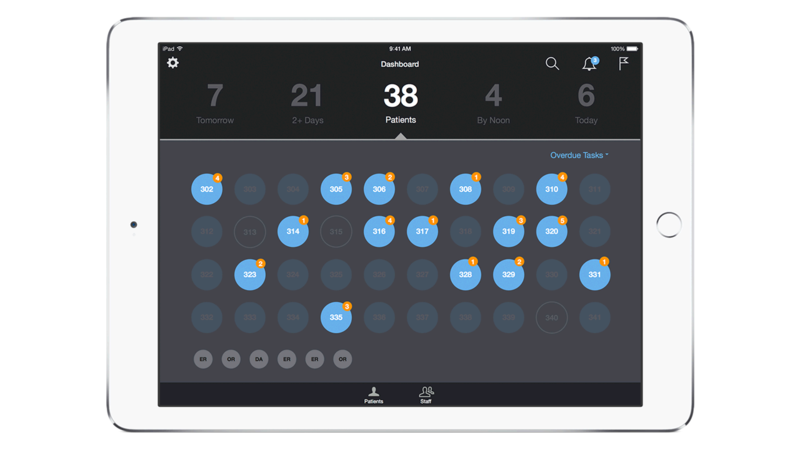 IBM MobileFirst for iOS Hospital Lead organizes and prioritizes essential tasks so leaders can manage patient units effectively. Leads log in to a central landing page of all beds in the unit, coded by filled or empty status. Pending admissions are at the bottom. Simply drag and drop to move any patient to an empty bed, or send to the OR or labs. Flag beds with new alerts and reminders if desired. Filter the view to show only those assigned to a particular staff member, ready for discharge, waiting on delayed tasks or other data. Tap a bed to see patient information, care plan, outstanding tasks and more. Identify areas where you must direct your attention to stay on top of timely discharges, labs, patient requests and new orders right from the main page. Beds with flags have notifications. Tap the Alerts icon to see all notifications at once, then review them, create new tasks or reassign them, and remove them from your cache to concentrate on the most urgent matters. Hospital Lead recommends task prioritizations based on patients with the most urgent needs. Tap a room card to view patient discharge details, including barriers to a timely exit. Access the patient’s care team, as well as their notes, vital signs, diagnostics and patient requests. Full details are available, including everything in the electronic health record (EHR). Tap to add notes, including voice memos and photos, or attach existing files to new text messages. Tap a contact to text, phone or initiate a FaceTime session without leaving the application. Through its service plan, IBM and Apple have teamed up to provide you with the most comprehensive support available. It includes 24/7 phone support from Apple and next-business-day on-site service from IBM. Whether buying or leasing devices, the IBM flexible procurement model enables you to go from procurement to deployment quickly. You can also manage all your iOS devices from a single portal and effortlessly apply security policies that ensure data protection on every device.